One of the strangest records that ever was on my turntable, is an LP called Jazz+Pop=Swing By Benny Golson and his orchestra. It was released on Audio Fidelity in 1962 and although the producer was not mentioned, I read in a discussion in a newsgroup that Charles Pater knew it was Tom Wilson. I could only borrow the LP, but I made a tape of it, that I play every now and then to remind me of the fact that the possibilities are infinite. 1.To hear a big band blend of Pop and Jazz, adjust stereo controls for full or normal stereo playback. Left stereo channel is heard alone. I am not a musician, but it seems to me that this is an idea that is way beyond weird. It seems more like a puzzle than music, but as you can hear on the LP, it is music too. In most cases the music is not very exciting, but as a lover of ideas and gimmicks this project fascinates me to no end. Is this the only attempt to do this? 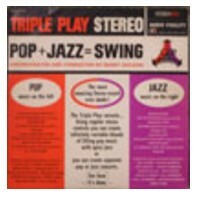 Are there more “triple play stereo” records? Here is one of the tracks; try to find out which songs are played on each channel!